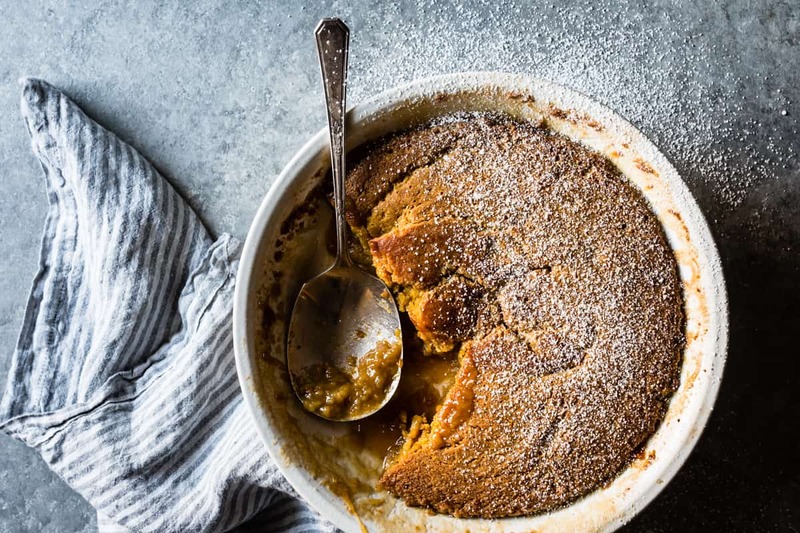 This gooey pumpkin pudding chômeur (aka pumpkin pudding cake or self-saucing pudding) tastes like warm pumpkin pie smothered in butterscotch, only far simpler. Gluten-free, refined sugar-free, and optionally dairy-free too. This dessert goes by many names: Pudding cake. Baked pudding. Self saucing pudding. Chômeur. 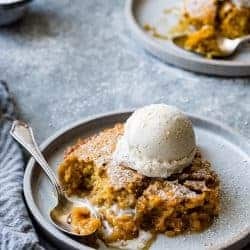 Call it what you like; around here, we call it “best dessert ever” and “dessert that we most likely want to eat any given night of the week.” It’s so quick and easy that we often do. Despite not having had much of a sweet tooth before I came along, Jay’s always had a soft spot for pumpkin pie. 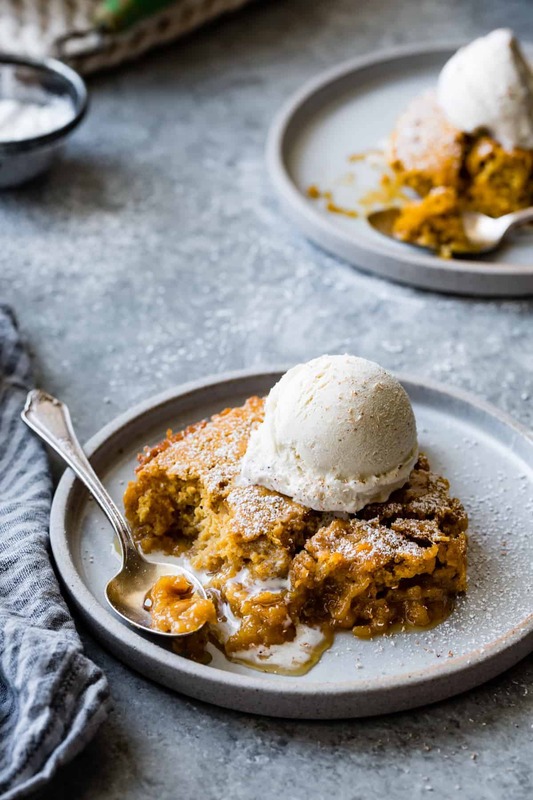 On this we can agree: pumpkin desserts should be enjoyed year round, not relegated to the weeks leading up to Thanksgiving. I have strong feelings about pumpkin pie and put my ultimate version, complete with a flaky buckwheat crust, in my cookbook. Pumpkin pie does take a bit of fussing to get just right: ideally, fresh squash puree should be made, the crust should be blind-baked, the filling should be simmered on the stove and put through a sieve, and the pie should be baked at a low temperature to retain its silky texture, then given a lengthy cool down to make it sliceable. 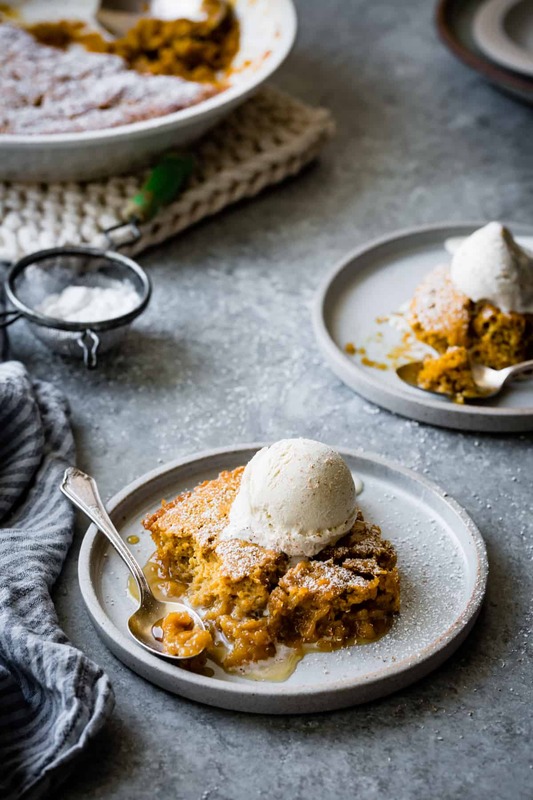 With these steps, pumpkin pie does become a bit of a special occasion dessert. Not so chômeur, which means “unemployed person’s pudding” in Québecois and was commonly made from pantry staples. Just whisk together a thick, one-bowl cake batter, pour over it a mess of butter and maple syrup, stick it in the oven, and when you pull it out, it will have magically transformed into distinct layers of springy cake and gooey sauce. 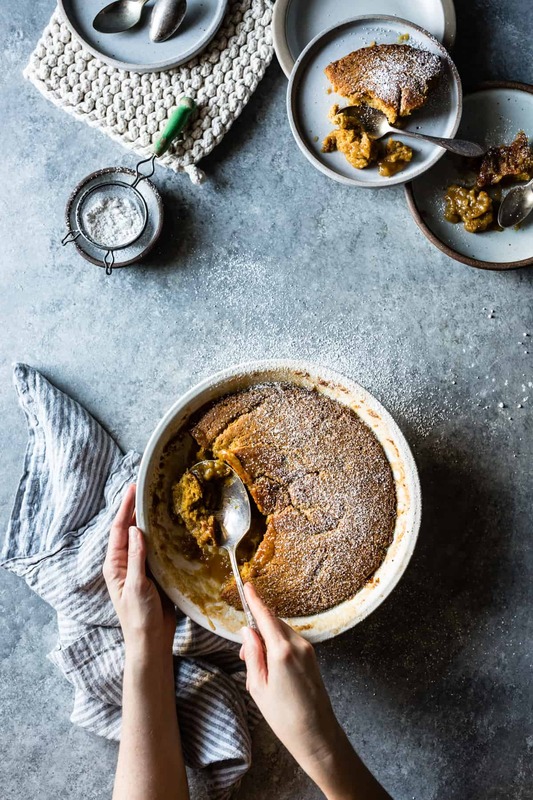 This pumpkin pudding chômeur uses the same simple method, just a slightly longer ingredient list than the classic thanks to a handful of pumpkin spices and a trio of flours – oat, millet, and sweet rice – that keep it gluten-free. 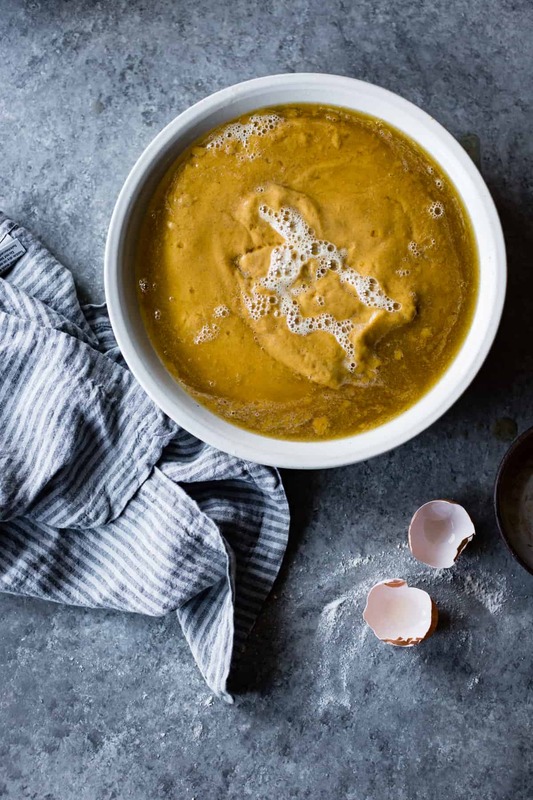 Pumpkin adds its orange hue and earthy taste (canned works perfectly well, though roasted pureed kabocha and butternut can stand in if you happen to have some on hand). The base recipe comes from the maple queen herself Katie Webster. I shared a GF chestnut flour version of the chômeur from her book a couple of years ago, and I got to thinking that a pumpkin version might be a winner in our pumpkin dessert loving household. I was right. 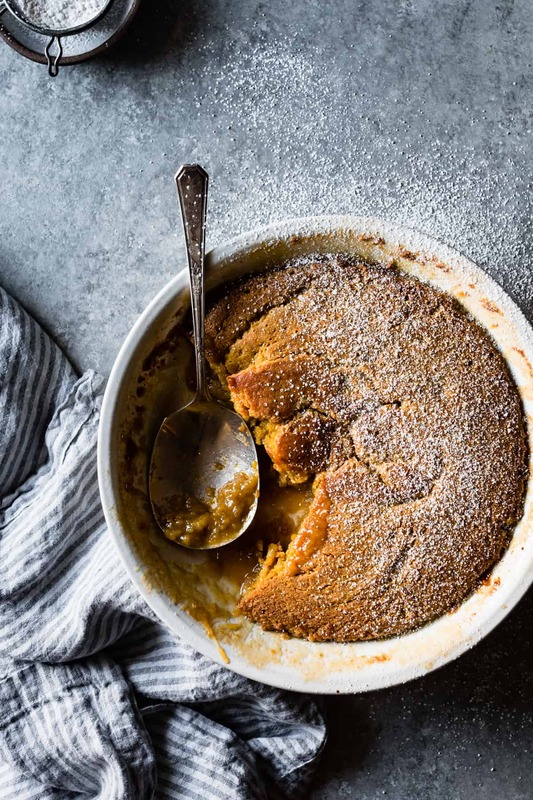 I’ve probably made this pumpkin pudding chômeur more than any other dessert in the past year. We can’t seem to get enough of springy cake meeting gooey maple sauce, all swirled together with a melty scoop of vanilla ice cream. It’s simple to throw together and can go from raw ingredients to luscious spoonfuls in your mouth in about an hour. 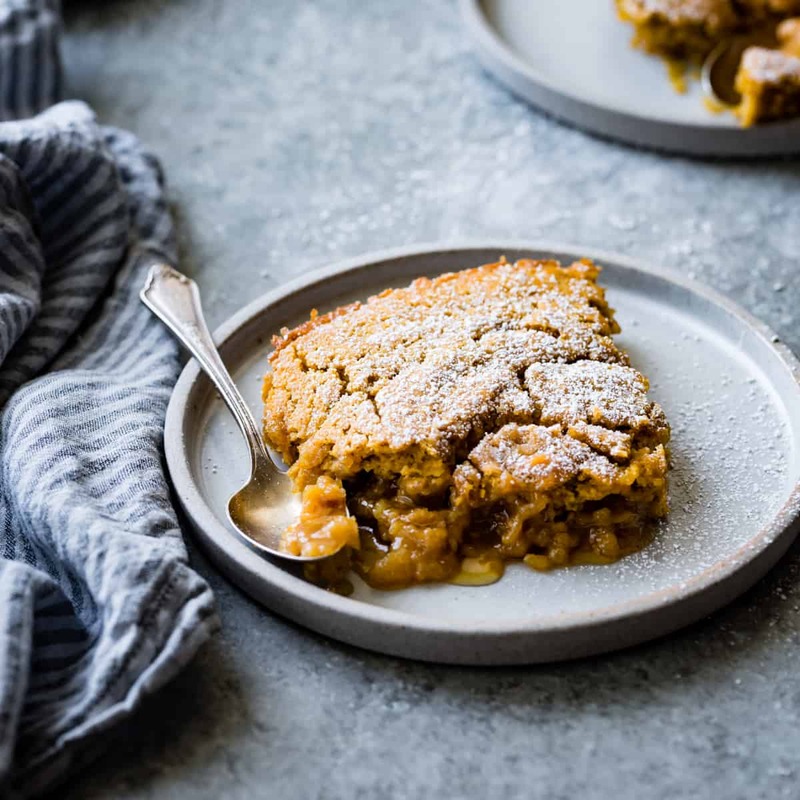 If you’re making it for guests, you can bake it up to several hours ahead, then reheat it in the oven until bubbly hot when you’re ready to serve up dessert. It keeps well for several days and reheats beautifully. The chômeur gets added depth of flavor from millet and oat flours, both of which help to temper the inherent sweetness in a recipe that contains nearly a cup of maple syrup. Happily, maple is the only sweetener here – no refined sugar needed. 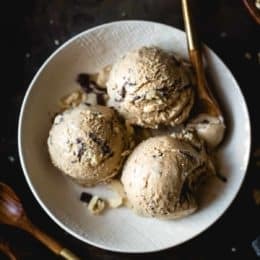 I’m curious to try a dairy-free version of this using Miyoko’s vegan butter and 2 tablespoons each almond yogurt and almond milk in place of the dairy in the recipe. (UPDATE: I did! And it’s every bit as good as the original.) Luckily for us, we don’t seem to have a problem getting rid of too much chômeur! 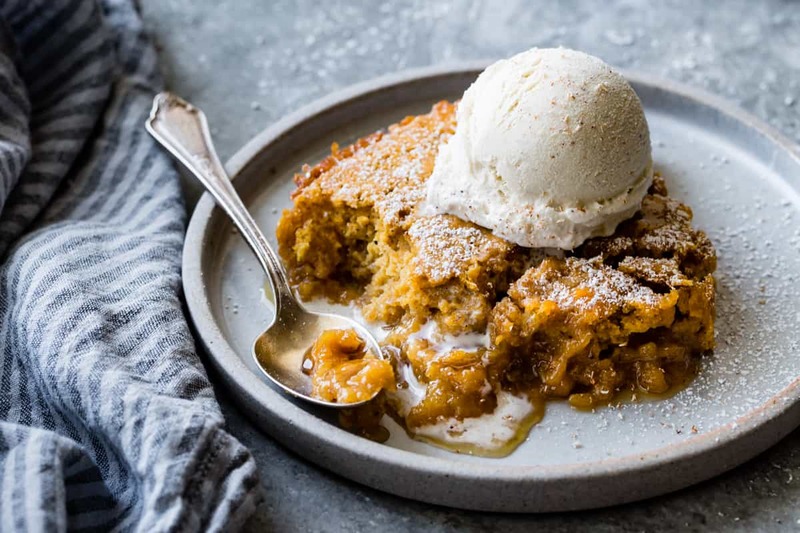 This gooey pumpkin pudding cake comes together in under an hour. A trio of flours – oat, sweet rice, and millet – keep it gluten-free. To feed a crowd, double the recipe and bake the chômeur in a 9x13-inch lasagna pan, increasing the baking time as needed. This works beautifully when made dairy-free, too – we couldn't even tell the difference. I've included my favorite DF ingredient swaps below. Position a rack in the center of the oven and preheat to 375ºF. 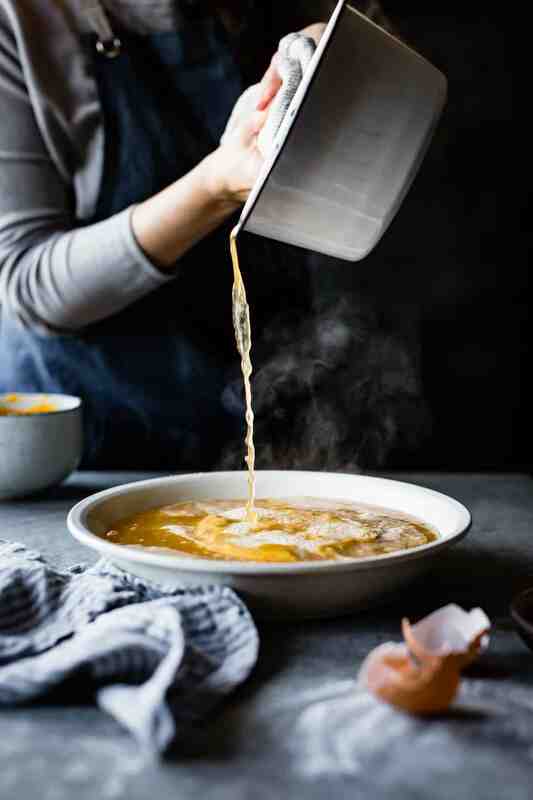 Lightly butter a 9-inch round cake pan with 2-inch high sides or a 10-inch pie pan (or the equivalent) and place on a rimmed baking sheet to catch any drips. In a small saucepan, combine the butter, maple syrup, and water. Place over medium heat until the butter melts, then remove from the heat. In a large bowl, sift together the millet, sweet rice, and oat flours with the baking powder, cinnamon, ginger, nutmeg, allspice, and salt. 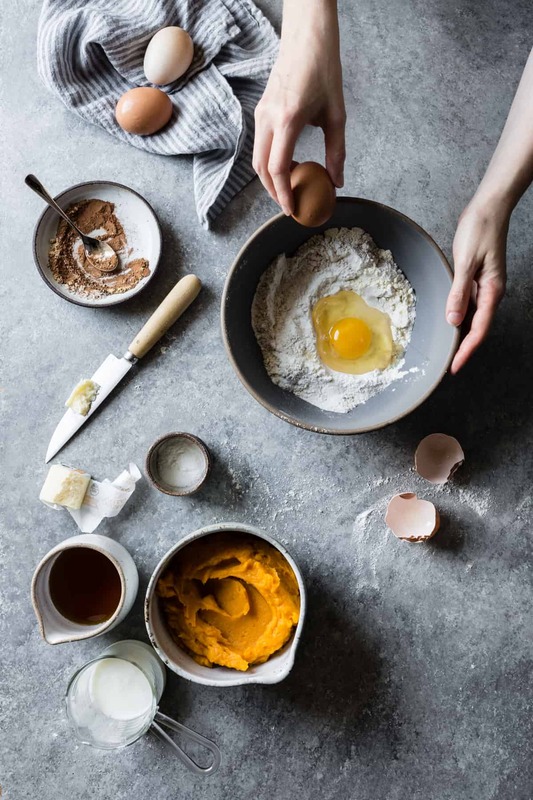 Make a well in the flour mixture and add the eggs, pumpkin puree, buttermilk, maple syrup, vegetable oil, and vanilla extract. Whisk until well-combined. Scrape the batter into the prepared baking dish and pour the maple-butter mixture over and through the batter; the cake batter will begin to float to the top. Carefully transfer the baking dish to the oven and bake the chômeur until the top is golden, the sauce is bubbling, and a tester inserted into the cake comes out clean, 30-40 minutes. Remove from the oven, dust with powdered sugar if desired, and spoon into bowls along with scoops of ice cream. Extra chômeur keeps well, refrigerated airtight, for up to 3 days. Reheat before serving. I never knew there was a fancier name for pudding cake! My mom used to buy those boxed versions when I was a kid, and it would be one of those things that even as a child, I could “bake myself” hahah – your version obviously sounds a million times better and must happen soon! Aw, I love that you had early experiences with chômeur and I’m a little jealous ;) LMK if you give this one a go! Thank you. Yesterday I was angry for the first time since my recent wheat/gluten sensitivity diagnosis, as my first major holiday approaches. This helps. 😀 It may even be my breakfast while the family gobbles cinnamon rolls, my signature holiday treat. I found a deal on the kindle version of your book and I’m avidly reading through it. It looks like I’ll need the paper version as well. I did make the raspberry swirl biscuits since we were gifted a pumpkin pie and I scored organic raspberries at our farmers market. But I couldn’t eat it! Please help. I’ve not used millet before. You describe it as mild but it was so bitter! I have been baking happily with sweet rice and oats, so much tastier than the usual rice starch blends. I read millet goes rancid and gets bitter. What do you think? Is it me or the flour? Suggestions for substitution? I’m not complaining. The dough was amazing to work up and baked just as you said, crisp edges and soft lovely middles. My millet is Bob’s Red Mill with a freshness date at least a year from now. Thank you! Hi again, I did an experiment mixing each of six flours with water and baking them on the griddle like pancakes. It was very interesting to see the difference in cohesiveness. The millet was very bitter to me. The corn was somewhat bitter but less and the rice, oat, buckwheat and teff were pleasant. I do not detect any odor in the millet. I will call Bob’s Red Mill for help, but it looks like I will need a substitute for millet. I have not tried sorghum. Thanks for any insight you have. Wow, what a cool experiment! Thank you for sharing your findings – that’s super interesting! Millet is for sure bitter on its own, which is why I like to use no more than 1/3 in a blend of milder flours, but absolutely sub it out if it isn’t to your taste! I’d be curious as to what Bob’s has to say, too. I’d be curious to see what you think of chestnut flour, too. It’s very fluffy and powdery, and the flavor is sweet but assertive. Please let me know what you end up trying! Alanna, thanks for hanging in there with me. Bob’s Red Mill suggested trying again. I saw you pinned Snixy Kitchen’s snickerdoodles soni tried them with total success. I chose that recipe because it uses baking soda rather than baking powder. I’ve always disliked baking powder flavor. I suspect my problem with your biscuits was a combo of flavors. I will try again as the dough was lovely to work up, and isn’t baking largely about that? I so appreciate you and the few others who are baking without the gluten substitutes. I don’t tolerate any of them. Xanthan gum causes my throat to close up. It’s that important to me. Thank you. I have celiac, and this is my absolute go-to site for any dessert. I especially love that Alanna doesn’t use artificial products such as gums, which I suspect I’m also developing an allergy to, ugh! Question about the pudding (I cannot say “self-saucing pudding” with a straight face after The Great British Baking Show.) Is it possible to substitute another flour for the oat flour–perhaps sorghum? Or is it too different in consistency? (I’ve done it in your blackberry scones when I didn’t have millet flour on hand and it worked, but not sure about oat flour. And I really don’t want to use brown rice flour if I can avoid it.) Thank you! Aw, thanks so much for the sweet words Susan – I’m so glad you’re enjoying TBG! I need to watch that Great British Baking Show episode – I’m ashamed to say I haven’t watched it at all yet! I think sorghum would be a good choice to swap in for the oat flour; maybe add in a tablespoon or two of tapioca flour since sorghum tends to be more brittle and less starchy than oat? If you happened to have chestnut flour on hand, that would probably work too. I tried these once with buckwheat in place of the millet flour, and the flavor and texture were great, but the pudding was UGLY, hahaha. Please let me know what you end up trying! You have no idea how much I want this in my life – hahha! Please tell me you think it’ll be ok to ditch the buttermilk and use water instead since it’s such a small amount?? Hi Rachel! Aw, thanks for the sweet words! Water could work; you’d probably only need 2-3 tablespoons since water is so much thinner than buttermilk. Let me know how it comes out! Maple and pumpkin? In one dish? genius! Holy friggin moly! I’m obsessed with your food photography! Seriously amazing job! 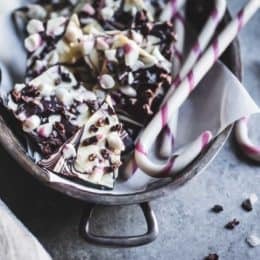 This recipe looks and sounds utterly amazing! Aw, thank you Christina – that means a lot to me! I think I just fainted. I cannot wait to make this Alanna! Thank you so much for the shout out too. Lol, the maple queen! Love it! That’s you! Thank you SO MUCH for the amazing maple syrup and for introducing me to chomeur – best dessert ever!! 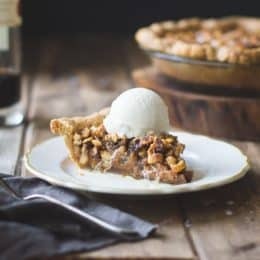 I just made this for thanksgiving dessert and it was amazing!!! Thank you so much for the recipe, Alanna! Yay! Thanks so much for the sweet note! I also just made this for Thanksgiving dessert and we all loved it! I adore maple syrup so I’ve been wanting to try one of Katie’s recipes for some time. Glad I did with your delicious pumpkin GF version, Alanna. Thanks so much!!! Made this almost as written, but used 2 tbsp melted and cooled butter in place of the vegetable oil. Super simple recipe and it turned out amazing – we didn’t miss the pumpkin pie at all. We did find the sauce to be quite sweet. What are your thoughts on cutting the maple syrup down to 1/2 c? Or even cooking this maybe with some sort of applesauce? Hi Alanna! Thank you for another amazing gluten free dessert recipe. My daughter has recently decided to eat a vegan diet so I tried the subs you recommended (Mrs. Miyoko’s vegan butter, 2T almond milk mixed with 2T plain almond yogurt) and it was delicious! I also used butternut I had cooked and drained for scones instead of pumpkin. Will be making this again and again! Aw, perfect! I tried those options too and was happy with the results – will update the recipe. Thanks so much for trying it out and for the sweet note! Wow, i have to try this. I grew up in Montreal and my mom use to make pudding chomeur all the time in winters. Now that i eat gluten free, i would love to try this but i don’t like pumpkin. Can i just leave it out? If i do, will it be like the traditional white cake? Thanks and Happy New Year.